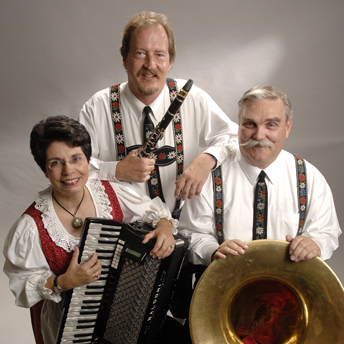 The Alpen Spielers are a dynamic and energetic German polka band from the Kansas City area. They perform the various styles and vast repertoire available to polka bands with enthusiasm that draws the audience into the music. Formed in October 1982, The Alpen Spielers have performed in and around Kansas City for parties and events. 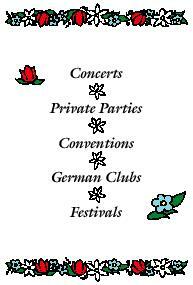 During the last twelve years, the group has been featured at polka festivals thoughout the United States, including the notable Wurstfest. Betty Jo Simon, Steve Patke, and Paul Rodabaugh form the nucleus of the Alpen Spielers; however, the group often expands to include drums and trumpet for larger festivals. From Waltzes to Marches, Ballads to Tangos, Schottisches to Polkas--the Alpen Spielers' music is for toe-tapping, dancing or just listening. Betty Jo Simon, leader of the Alpen Spielers, brings endless enthusiasm to the stage as vocalist, accordionist and music arranger. Her accordion has been equipped with a Musical Instrument Digital Interface (MIDI), which combines the acoustical accordion with the authentic orchestral sounds of the Roland U-220 sound module. Betty Jo performs outside of the Alpen Spielers as a concert artist with her MIDI Accordion. 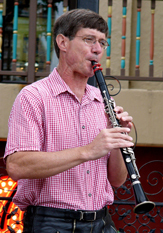 Mark Cohick has been a freelance woodwind player in the Kansas City area for over twenty-five years, and has performed with the Kansas City Symphony, Kansas City Ballet, and Lyric Opera, as well as the Starlight Theater Orchestra, Kansas City Repertory Theater and Theater League productions. Mark has toured Europe with several New York productions of Broadway shows, and currently plays in the Philharmonia of Greater Kansas City, St. Joseph Symphony and the Liberty Symphony Orchestra. He is also adjunct professor of woodwinds at William Jewell College. Paul Rodabaugh provides the ensemble with a solid foundation playing tuba and alphorn. Drawing from experience as a music educator, Paul is skilled in many styles of music, including symphonic, Dixieland, musicals and ethnic. Paul also plays with other jazz and classical groups in the Kansas City area. It is with a heavy heart, that the Alpen Spielers bid farewell to our friend, fellow musician, woodwind artist, and one of the original "Spielers", Steven Patke on June 25, 2005. Steve helped coin our name and his versatility and expertise on reeds added so much to our music. He was truly a musician's "musician". We are grateful we knew Steve and will forever cherish the time we had with him. Listen to samples of each of these songs by clicking on the Play button next to each song's name. (print order form) Alpen Spielers - Wunderbar!